Differences between it and the F-4B were not so obvious whenlooking at the aircraft. Major clues were the lack of an IR seeker head underthe radome and larger afterburner petals on the engine. The outside of theintakes on later F-4Js had sprouted short, skinny ECM antenna bulges. Inaddition, it had the thicker wings and wheels of the USAF F-4C/D and a slottedstabilizer to help improve slow speed handling. The main differences were, as in most aircraft modifications,internal. This included uprated engines, a more powerful electrical generator,new radar system as well as a lot of newer radios and navigational aids. An ASW-25 Automatic Carrier Landing System was also part of the upgrade. Nearly600 F-4Js were built between December 1966 and January 1972. Many of theseaircraft saw service in Vietnam and those that survived were later modified toF-4S standard. It is hard to believe that thisparticular kit is now over ten years old, however, it is still considered bymany to be the finest US F-4 kit around. 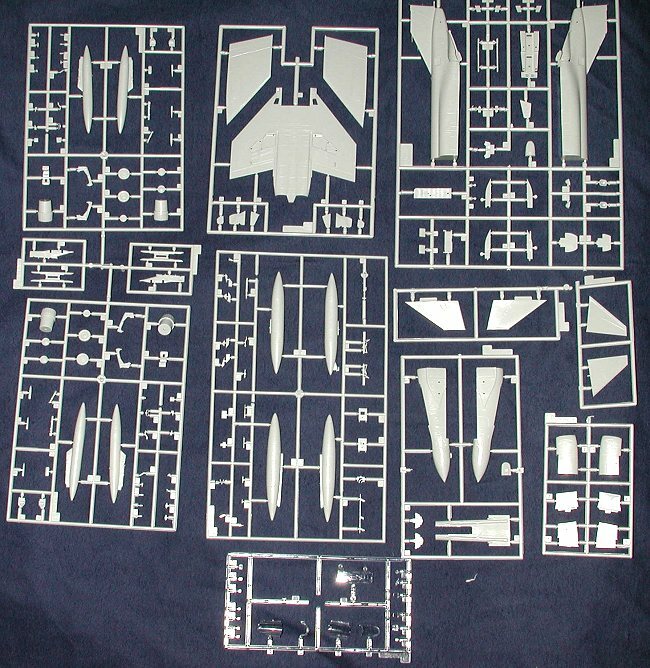 Hasegawa went whole hog into current tendencyto offer as many common sprues for a basic airframe and then adding additionalsprues for the type being kitted. This means several things. One is that thereare usually a number of spare parts left over from the kit and secondly, thereare a lot of smaller sprues which makes for a really full box. Thekit was state of the art in 1990 and still holds up very well. All the partshave engraved panel lines, which is the expected norm, and there are lots ofthem. In fact, many think that these multi-version kits are a bit too intricatewith too many parts. In several ways, I must agree. The greater the number ofparts, the greater the chances of messing something up! However, it is the mostcost effective way for Hasegawa to produce multiple versions of an aircraft,otherwise the additional tooling cost would have to be passed along to theconsumer. Hasegawa cockpits are usually devoid of sidewalland instrument panel detail in 1/72 and this one is no exception. Theinstruments and side console detail is provided by a decal and that is adequatefor this scale. Also typical of Hasagawa kits is that there are no externalstores beyond the wing and centerline drop tanks. For these items, you need tobuy the Hasegawa weapons sets, an additional expense. All of thesprues, including the clear bits are packed together in a single clear bag.Drawback of this is that by the time the modeler gets the kit, the parts are allwell scratched by rubbing against each other during shipment. Other kit makersuse multiple bags to prevent this damage. Why Hasegawa still does not do this isbeyond me. The only real option on the kit is for open or closedcanopies. Missing are the canopy actuating arms that hold the canopies open. Thekit also has no provisions for lowered slats, speedbrakes or flaps. Phantoms onthe deck are often seen with drooped flaps or speedbrakes. Instructions are typical of laterHasegawa kits. It has 14 construction steps and an excellent paint guide usingGunze Sangyo paints. FS 595 numbers are given where needed. There is also aweapons load chart showing you where to put what weapons. Decals are for threeaircaft, two of them in gloss gull grey over white and one in overall gull grey.The box art aircraft is the overall gull grey bird and is for the CAG bird fromVF-21. The black canopy and nose markings are given as decals. Next is a VF-31bird which sports a Mig kill on the splitter plate. Whether this is an actualMig Killer or not is unknown as all of VF-31s F-4s were adorned with this killmark at one time. Finally a VMFA-212 F-4J. This particular aircraft has an allwhite tail. The decals are Hasegawa in-house ones and as such will be a bitthick and not respond well to setting solutions. Also typical of Hasegawadecals, the white in the national insignia is a cream color. Interestingly, thewhite in the VMFA-212 tail marking is a pure white. Why this doesn't carry overto the insignia is a mystery. As another note on the VMFA-212 markings, Ibelieve the blue on the sheet is too light and should be darker. As always,check real photos to make any determination on that. Now in spiteof all the nitpicking, this is still a superb kit and one that you shouldactively seek if interested in modeling US Phantoms in this scale. Carefulconstruction and attention to the building steps will provide you with asuperior kit that will look great on your model shelf. If there isn't enoughdetail in the kit, then there are a number of aftermarket detail sets and decalsheets to customize your F-4. 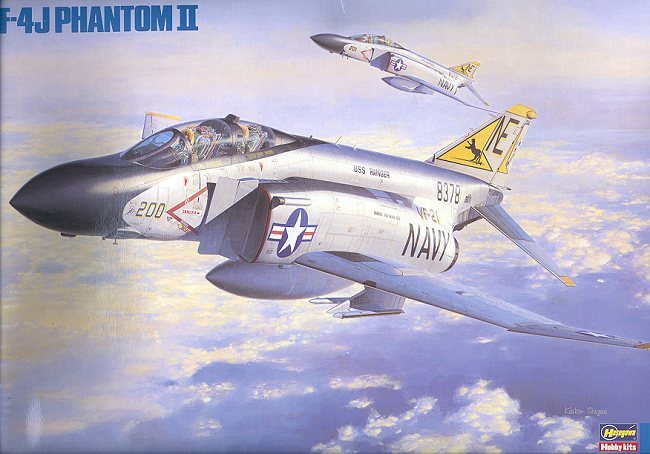 A final note on this kit.This was later released as an F-4J/S with the same box art. Not sure if thedecals are the same, but it would definitely have had the updated leading edgemaneuvering slats that were fitted to all but the first F-4S aircraft.